Asheville Buncombe Food Policy Council – Blueberries ripe for the pickin’! 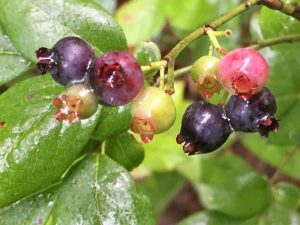 Hikers, farmers, and homegrowers have already picked baskets full of sweet, plump blueberries, and our wild “low bush” variety is ripening in low-elevation wooded areas like Bent Creek. Sometimes referred to as “brain berries,” blueberries are high in antioxidants and pack an altogether powerful nutritional punch. Watch out, though, because “conventionally grown” blueberries are generally very high in pesticide residue. Grow your own, pick your own, buy from trusted sources! HERE is some great nutritional information & HERE is a tasty looking recipe!